A lacquer rectangular table of typical mitred, mortise and tenon frame construction, supported on four square-corner legs ending in horse hoof feet. 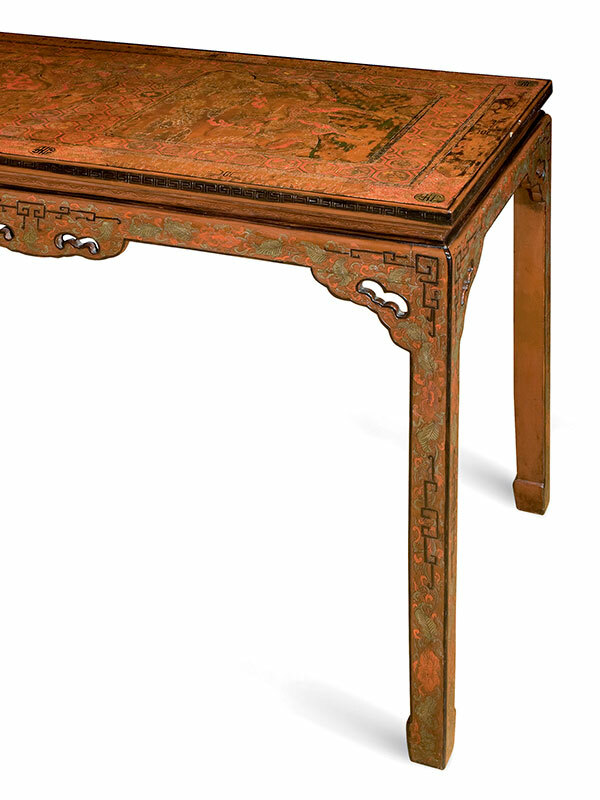 The table is decorated in two techniques: it is painted in coloured lacquer (miaoqi) and engraved gold (qianjin) techniques. The top of the table is lightly carved with two main decorative panels, one is octafoil in shape and has a four-clawed dragon chasing a flaming pearl among cloud scrolls, the other panel is square and is decorated with a qilin in a landscape setting. Both panels are framed in key-fret pattern on a ground of large octagonal diapers, each containing cloud scrolls and separated by wan-symbols. The outer border has bats in panels, alternating with shou symbols and key-fret pattern. The sides are densely filled in with various auspicious decorative motifs, including lingzhi fungus, bats, and wan diapers. During the late Ming dynasty the techniques of painted colour lacquer (miaoqi) and engraved gold (qianjin) techniques were popular, and the present table represents a excellent example. The painted lacquer technique is achieved by painting on the lacquer surface using a variety of colours, whilst the engraved gold technique is executed by filling lacquer glue and gold power into hair-like lines engraved into the lacquer surface. 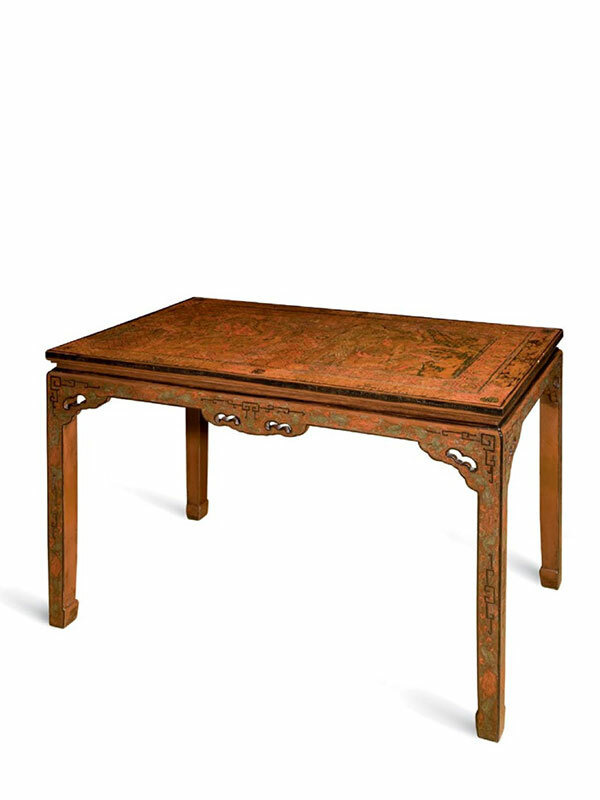 Two rectangular lacquer tables, both in the Qing Court Collection at the Palace Museum, Beijing, are comparable in style and design: a slightly smaller table decorated with a cloud-and-dragon pattern is dated to the Ming dynasty; the other is dated to the early Qing dynasty; it is larger and decorated with five dragons. 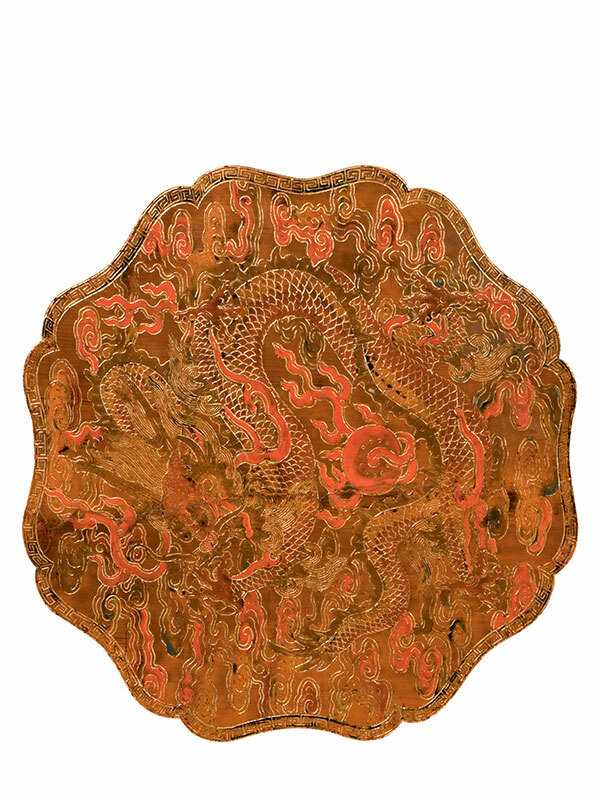 A further comparable square lacquer table, depicting a five-clawed dragon on the surface and similar in style but dated to the Wanli period (1573 – 1620), is in the collection of the Museum für Kunsthandwerk in Frankfurt-am-Main.